Woman who fled with her American-born daughter to Israel indicted on eight criminal counts. A Fair Lawn, New Jersey woman who fled with her American-born daughter to Israel last year has been indicted on eight criminal counts in the United States. The woman has received the support of the Israeli Supreme Court in her refusal to return to the U.S., arousing the ire of a New Jersey court which ordered her to return. NorthJersey.com reported that the indictment handed down by a Bergen County grand jury August 9 charges Oshrat Ben-Haim, 30, with absconding to Israel with her 2-year-old daughter, Ofir. She is charged with two counts of contempt — for violating two court orders instructing her to return the child to the United States — and six counts of interference of custody. Sharon Ben-Haim resides in Englewood, NJ, and has not seen his daughter since just before her first birthday. New Jersey Superior Court Judge Bonnie Mizdol ruled last year that Ofir must be returned to the U.S., but the Israeli Supreme Court, in a panel headed by Judge Edna Arbel, chose to ignore her ruling. 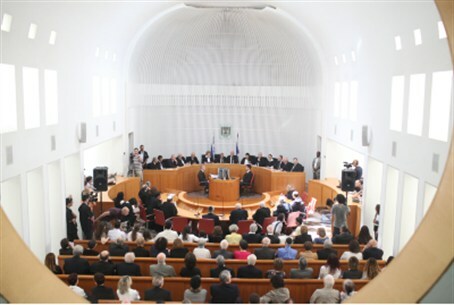 Judge Mizdol determined that the Supreme Court of Israel acted in contravention of the Hague Convention and refused, in turn, to accept its decision. She again ordered that the girl be returned to the U.S., but Israeli authorities have not complied with her decision. Sharon Ben Haim has filed a multi-million dollar lawsuit against Judge Arbel, Rabbi Daniel Edri of the Haifa District Rabbinical Court, and three top welfare officers – Simona Steinmetz, Batya Artman and Niva Milner, among others. "Oshrat is preventing me from seeing Ofir and separates her from me in a cruel merciless manner," wrote Sharon on a website dedicated to his struggle. "Even the New Jersey local court order instructing the mother to allow contact with the father on regular times is completely ignored by Oshrat, and except [for] a few Skype conversations in the past Oshrat is preventing any contact and blocks my access to my daughter, and so I’m denied from being a part of her life." "Since my daughter was separated from me I’m having trouble sleeping at nights, my mental and physical state has deteriorated, I’m trying to hold on to the hope that maybe someone can influence my partner to give me what I rightfully deserve – being a part of my daughter Ofir’s life," the distraught father wrote.